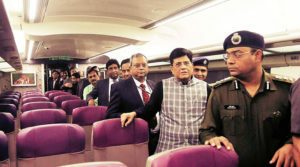 Prime Minister Narendra Modi will soon flag off Train 18 which-the country’s quickest train – on the Delhi to Varanasi route, Union Minister Piyush Goyal said Thursday. The train, design below the ‘Make in India’ initiative, will pave the way for bullet trains, the railway’s minister added. ‘Prime Minister Narendra Modi can launch Train 18 on Delhi Banaras route, it has a maximum speed, built with indigenous design in Indian factory under Make in India initiative,’ Piyush Goyal said. He was speaking about the launch of PSU Concor’s containers voyage through coastal shipping flagged by Shipping and Road Transport Minister Nitin Gadkari. Piyush Goyal said Train 18’s run time would be eight hours, about ‘one and a half’ times faster than the fastest train on the route. ‘For bullet trains, this will be the first baby step in that direction,’ the minister said. He said the Indian Railways has taken many initiatives in the last ‘four and a half’ years and has utterly stopped old coaches and introduced LHB coaches for passenger safety. He said Indian Railways will be one amongst the primary railways in the world to be run entirely on electricity. A Rail university has additionally been started with the objective to augment the transportation sector, he added. An unmanned level crossing on the broad gauge is negligible, he said, claiming that perhaps only one such unmanned crossing exists. Railways contribute considerably too low freight transportation, he added. There will be two classes – one regular and another executive class – and they will be fully air-conditioned, he had said. The Railway Protection Force (RPF) is running campaigns to sensitize individuals on the Train 18 route so that incidents just like the one that happened recently close to Delhi, wherever a stone was thrown at it during a trial run, were not repeated, Goyal had said. This train has a number of features to enhance passenger comfort, including interconnected fully-sealed gangways, automatic doors with retractable footsteps, GPS-based passenger information system, modular toilets with bio-vacuum systems, rotational seats which will be aligned in the direction of travel (available only in the executive class), roller blinds, diffused LED lighting and differently-abled-friendly toilets.